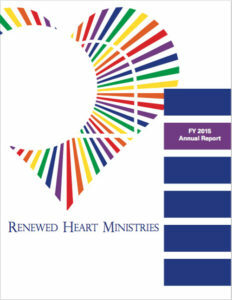 On behalf of all of us here at Renewed Heart Ministries, I would like to thank you for your continued support of RHM during 2015. Your financial partnership with us enables us to continue our passion all around the globe. Your partnership with us in 2015 enabled us to do some pretty amazing things. As you well know, we are a not-for-profit, 501(c)3, religious, re-education ministry that is passionate about helping people rediscover, explore and follow the teachings of the historical Jesus. This past year we have witnessed, over and over again, some of the most beautiful stories of healing and restoration in the hearts and lives of those we’ve had the privilege of serving. In this annual report you will not only see some of what we were able to accomplish in 2015, you’ll also see a few of the projects we hope to accomplish in 2016, as well. The generous support of people like yourself make it possible for our ministry to exist and to continue being a presence for positive change in our world. Together, in following the example Jesus set before us, we will continue to make a difference in the lives of those we come in contact with in 2016. Here’s to another year of working toward making our world a safer, more just, more compassionate home for us all, till the only world that remains, is a world where only love reigns.